Your windshield is one of the most important safety features on your vehicle. Should you ever happen to be in an accident, your windshield is what prevents you from being ejected from the car. You windshield also provides support for your airbags. And your windshield offers support to the roof of your car and keeps it from collapsing. These are all reasons why your windshield is important and why you should do what you can to keep your windshield in good working order. While many vehicle owners pay close attention to their cars and keep the oil changed and tires rotated, many neglect their windshield. They may take a crack or a chip for granted and just ignore it. But this would be the wrong thing to do. If your windshield has suffered any damage, you should take your car to your Long Island windshield replacement shop and have it inspected. Even if there is nothing wrong with your windshield, you should take good care of it by following these tips to prevent damage. There is more than just dead bugs and dirt on your windshield. Your windshield is probably also full of bird droppings, tree sap and hard water spots. Even if your windshield looks clean, this isn’t always the case. Use a mild soap and avoid harsh chemicals to clean your windshield and restore clarity. Wiper blades are notorious for tearing and otherwise breaking with minimal cause. Not only do torn wipers leave streaks on your windshield, the metal strip may come in contact with the glass and make fine scratches that won’t go away. When you first notice rubber peeling from your wiper blades or streaks on your windshield is when you need to have them replaced. As you travel down the highway, make sure you keep your distance from the car in front of you. Besides the fact that riding too close to the person in front of you is dangerous and unlawful, it’s a good way to catch a rock on the windshield and suffer damage. The cars in front of you are tossing back rocks and other debris all of the time, follow too closely and the chances of windshield damage skyrockets. It is especially critical that you stay far back of other cars when driving on gravel roads. Although it is unavoidable sometimes, when you get the chance, park your car in a shady spot out of the sun. Direct sunlight weakens glass and will shorten the lifespan of your windshield. You might just ignore the little chip you have on your windshield because it isn’t in your line of vision. Ignore it long enough and it will become a crack that extends the distance of your windshield. Don’t ignore that chip, get it fixed right away. After all, chip repair is a whole lot more cost-effective than windshield replacement. 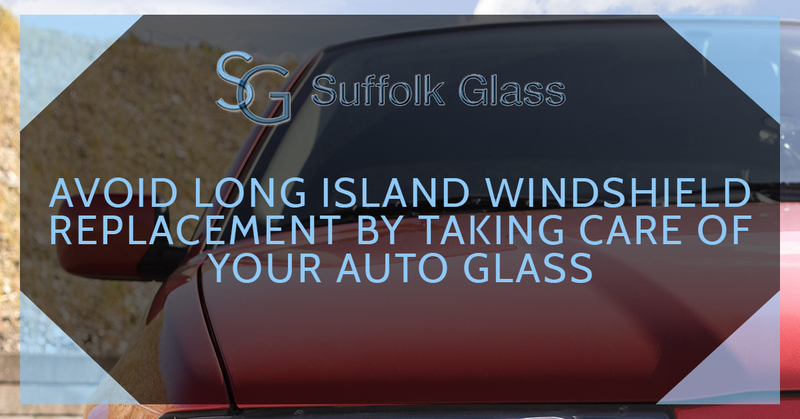 If you have a chipped windshield, give Suffolk Glass a call.